Petrohawk presented at the IPAA conference today. I've already discussed the midstream asset sale, but I wanted to note a couple of other update-worthy infonuggets. First, the company has reduced its 2010 Haynesville capital budget by $50 million to $850 million. Petrohawk says the reductions are based on "efficiencies" but I'm sure the low commodity prices might have something to do with it. 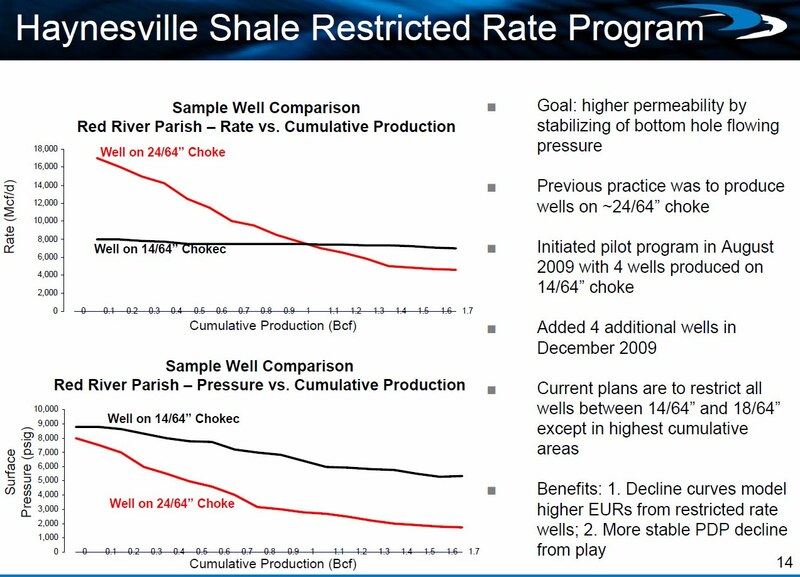 It's only a 6% reduction, but coming from one of the big Haynesville operators, it is a little ominous. In truth, it is mostly a budget shift, as the capex budget for Eagle Ford Shale in Texas increased by $40 million. The Eagle Ford shale produces more oil and natural gas liquids, which provides more attractive pricing in the current commodities environment. Petrohawk now plans a 15 rig average in the Haynesville and expects to participate in 275 wells (110 operated, 165 non-operated) in 2010. In a presentation three months ago, management expected a 17 rig average in 2010 and participation in 319 wells (112 operated, 207 non-operated). As of last week, the company is still running 17 rigs in the Haynesville Play. Expect that number to drop a little in coming months. Second, Petrohawk provided a positive review of its restricted choke program. Recall that Petrohawk is one of the companies advocating a smaller choke size for its producing wells. The belief is that the narrower opening makes the conditions at the bottom of the well more stable and leads to improved gas recoveries. As the slide below indicates, by producing on a 14/64" rather than a 24/64" choke, Petrohawk achieves a flatter decline rate and higher pressures, both of which contribute to higher EURs. 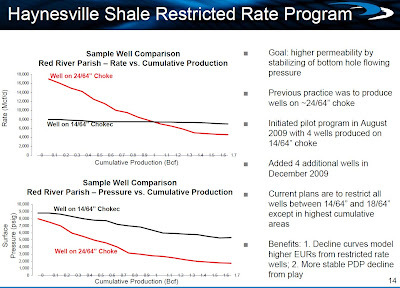 Going forward, the company will use the restricted choke scheme on most of its new wells. Petrohawk is already using a fairly high 7.5 Bcf EUR for its Haynesville wells and even with this new approach to choking back wells, its type curve remains unchanged.